A nossa vila casa está perfeitamente localizado no coração da Sea Pines Plantation e menos de 100 jardas de um belo trecho da pitoresca South Beach e Bradock Cove. Ele está localizado a apenas alguns passos do Sul Beach Village Marina com o famoso Salty Dog Cafe e uma abundância de lojas, restaurantes, bares e atividades recreativas. Passes são fornecidos para o seu uso gratuito da piscina ,. No último andar do Bluff Villas, esta casa de temporada de um quarto foi reformada e decorada com bom gosto. A sala dispõe de elegante sofá de três lugares exuberante e assento de amor separado. Além disso, há uma mesa de trabalho, acesso sem fio, TV de tela plana e DVD. Aberta para a sala de estar, área de refeições acomoda quatro no seu vidro mesa com tampo. A nova e moderna cozinha está totalmente equipada com todos os principais aparelhos necessários para uma relaxante, férias sem complicações. O serviço de TV e Wi-Fi foi recentemente atualizado para fornecer uma qualidade excelente velocidade de internet e imagem. A varanda sombreada enfrenta o oeste em direção à praia em meio aos carvalhos para capturar a brisa do mar delicioso e belo pôr do sol. O quarto aspecto triplo apresenta uma cama king-size, acesso à varanda e uma caminhada no armário. Há também um ventilador de teto e TV de tela plana. A casa de banho inclui uma vaidade de casal com uma caminhada moderna no chuveiro e piso frio. Esta casa de férias está totalmente equipado com tudo que você precisa para umas férias sem complicações, incluindo uma cozinha totalmente equipada, toalhas e lençóis. Localizado no coração da estância Seapines você está perto de golfe de campeonato e instalações de ténis e bem como milhas de ciclovias e praias. Para os amantes da praia a praia é menos de 100 quilômetros de um trecho de South Beach, que oferece vista para Harbour Town e pôr do sol fantástico sobre Daufuskie Island. A curta distância é Tower Beach com churrasqueiras ao ar livre, mesas de piquenique e um pavilhão à sombra, que oferece vistas deslumbrantes sobre o oceano ea entrada para Calibogue Sound. O novo Seapines Beach Club fica a uma curta distância de carro ou de bicicleta. É um local de encontro para as atividades de areia e água, bem como um bar de praia e restaurantes para o almoço e jantar com vista para o oceano. Esperamos que você vai escolher a nossa casa de férias para a sua visita a South Beach & Seapines em Hilton Head. Loved our stay on the island! We loved our stay at Sea Pines. We actually loved it so much that we extended our time there for another night! Bob was extremely quick about responding and flexible since the property was available for when we wanted it. He quickly added another day for us. The rental property was clean and well maintained. We made use of the stocked kitchen and beach chairs. We were given 4 sets of clean towels. I believe one of the reviews said this but there was one roll of toilet paper so we did grab more for the week! The place had everything we needed for a comfortable stay. The bed was comfortable too. We did spend majority of our time outside exploring the Sea Pines Resort. We found the grounds to be extremely clean and well kept, and it was a relaxing place to be. We rented bikes for the week (rental available within walking distance of this condo) and biked around the 15 miles of off street bike trails within the resort property. We also switched between visiting three different beaches within the resort... One of them being within easy walking distance to the condo, the other two within biking distance. 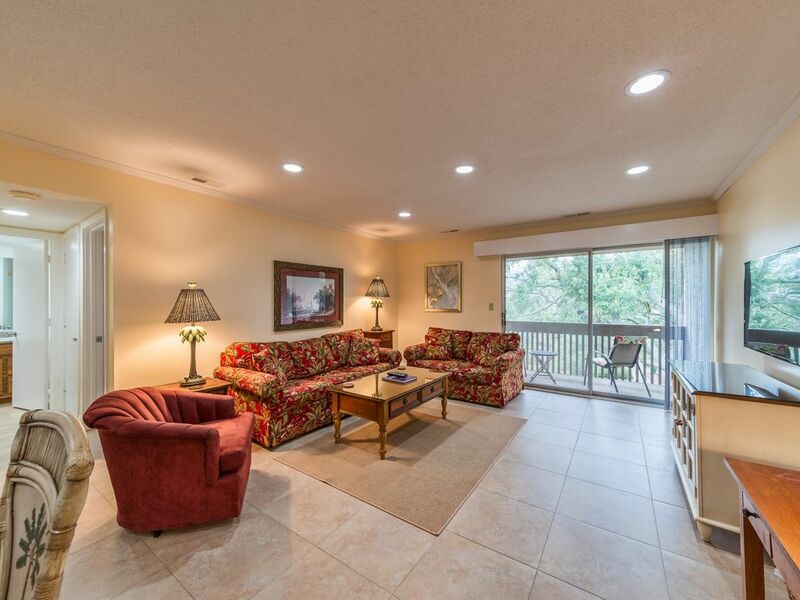 This condo is also located within walking distance of a small marina area that includes places to eat, listen to love music and participate in water activities. Overall a great condo in a great location. We enjoyed our stay in the beautiful Sea Pines community. The property was exactly as pictured and described. It was clean, comfortable, peaceful and quiet. Bob was very quick to respond to any questions we had. We would definitely stay here again. We stayed in this condo for 4 nights, December 31, 2018 and checked out on January 4, 2019. The description of this condo is noted to be on the "top floor with no elevator". The elderly might find this difficult as there are 4 flights of stairs. The condo is in a nice location and close to the beach but does need some attention. The living room furniture appears nice but it is not very comfortable. The loveseat was placed directly in front of the patio door perhaps to discourage tenants from using it due to the broken door latch. You can enter the patio from the bedroom although we rarely used it. The king size bed was fairly comfortable, however the bedspread smelled of sweat..it was not clean. The mattress pad was old and worn thin. Additionally, the owner notified us the clothes washer was not working. He assured us it would be repaired on the afternoon of Wednesday January 2nd but no one showed. The owner advised us on Thursday afternoon (1/3/19) that the repairmen couldn't enter the Sea Pines security gate on Wednesday because it was after hours. The owner then advised us that a repairman would be there on Friday, January 4th...the day we were to check out. You would think that the scheduled repair would be first on the list for Thursday, January 3rd rather than Friday. The owner could "only offer his his apology". Despite the issues mentioned above we enjoyed being close to the beach. Thanks you for your feedback and we are glad you enjoyed being close to the beach. While we appreciate it’s not the best review we have ever received we acknowledge that you have taken the time to let us know about your experiences, as it provides us the chance to improve for the benefit of future guests. Regarding the stairs, as we stated in our listing the villa is on the third floor. Therefore there are two flights of stairs separated by a landing between each floor. The furniture is clearly shown in the photographs on our listing and we are surprised that you found it uncomfortable as this has never been raised as an issue before and we personally find them most comfortable. There is also no attempt to block the access to the balcony. We are also surprised about your comment about the patio door lock as you did not contact us about this during your stay. Since your comment we have had the door lock inspected and confirmed that it is working normally. Perhaps it was not fully closed. Similarly you did not raise the issue about the bed during your stay. We can assure you that the bed and bedspread are clean and the bedding fresh for every guest. We had an unfortunate situation regarding the washing machine which had developed a fault despite being only one year old, which we had not been able to repair over the Christmas Holidays. This is why we contacted you before your stay to let you know of the situation. We were expecting the fault to be resolved quickly but the company who had agreed to repair it under the warrantee suddenly informed us they were going out of business and ceased trading. We therefore had to urgently find another company to make the repair. The information we gave you on the date of the repair was given in good faith as that was the date we were given. As soon as we found out that they had not attended as planned, we informed you and passed on the explanation they had given to us. They could not attend the next day but the repair was completed the following day. We appreciate this was an inconvenience for you as you were leaving on that day for which we repeat our many apologies. Booked last minute for four nights at 1693 bluff villa, owner Bob was very easy to work with. I would book this villa again, as it was in a great location, nicely furnished, easy parking and very quite. It was great!! Clean and comfortable!